Multiple explosions in Maiduguri, Borno State capital on Sunday night killed 16 people, including a wedding team and the suicide bombers. The explosions occurred at Muna Garage and Muna Dalti, suburbs of Maiduguri, which had experienced more than five blasts in the past. 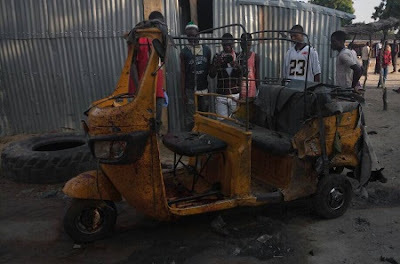 Commissioner of Police, Borno State Command, Mr Damian Chukwu, said a male suicide bomber with explosives strapped to his body caused the first explosion at Muna Garage, killing himself and 13 persons. Five persons were also injured. In another development at Muna Dalti, two female suicide bombers detonated explosives killing themselves and injuring 13 persons. Chukwu put the total number of those that died at 16 and 18 injured. Muna Garage general area, the scene of the bombing, is located some 2 kilometres to the city centre. It has witnessed more than five suicide bomb attacks this year. The Sunday bombing came barely two weeks after four suicide bombers blew up themselves while attempting to scale the perimeter fence of a public hospital at the city outskirts. The wedding team comprising three men and a lady were said to be returning from a marriage ceremony in a tricycle. It was gathered that they had pulled up at a shop near Muna Garage, a suburb of Maiduguri, to buy packaged water at about 8.15pm when they met their death.